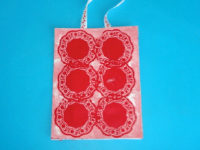 This two of hearts is a great Valentine's Day project. 1. Gather your material. 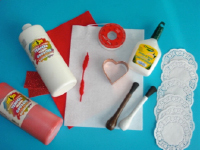 You will need red and white poster paint, six tiny paper doilies, red and white felt, scraps of red Fun Foam, paintbrushes, a heart-shaped cookie cutter, ribbon, a red pipe cleaner, white glue, and heavy cardboard (not shown). 2. 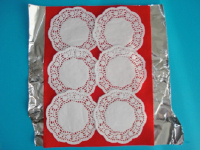 Arrange the doilies on the red felt as shown to represent the design seen on the back of a traditional playing card. 3. 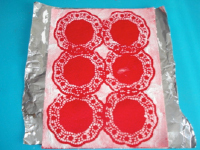 Apply white poster paint all over the red felt and doilies. Let dry. 4. 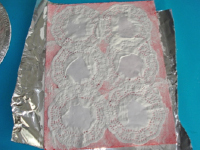 Gently remove the doilies to see pretty designs appear. 5. 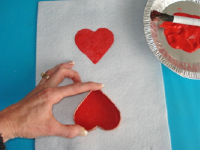 Use the heart-shaped cookie cutter to paint two red hearts in the centre of the white felt, one upright and one upside down as shown. Let dry. 6. 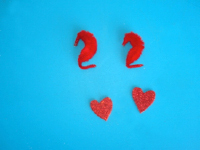 Cut the red pipe cleaner in half and use each piece to create a "2". Cut two small hearts out of the Fun Foam scraps. 7. 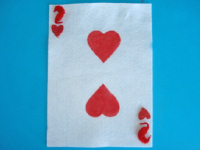 Glue the numbers and tiny hearts in the corners of the white felt as shown. 8. 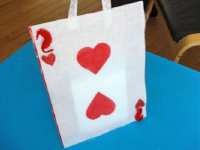 Glue both sides of your giant playing card together, sliding a piece of ribbon and a piece of heavy cardboard between the red and white felt. You can use the ribbon to hang your playing card.